New measuring stations for the GLONASS space-based satellite navigation system will be deployed in Antarctica until 2020. Scientists expect it will enable the control of more than 90 percent of satellite orbits and believe it could bring parity between Russia's navigation system and the Global Positioning System (GPS). Scientists from the Krasnoyarsk Territory and St. Petersburg plan to deploy an additional four to seven stations for the GLONASS satellite system (which is similar to GPS) in Antarctica by 2020 in addition to the three already operating on the continent. This will greatly improve the accuracy of the country's navigation system. This is not being done to enhance the consumer potential of GLONASS, stressed Yury Fateyev, a professor at Siberian Federal University, in an interview with RBTH. "These stations are used to set up functional additions to the GLONASS system for special applications – mainly for geodesy,” Fateyev said referring to the science of measuring and monitoring the Earth's shape and size. “What we are now deploying in Antarctica are measuring stations for the GLONASS system itself. They take measurements to determine the parameters of satellite orbits." According to Fateyev, the data from the measuring stations is not available to consumers. However, the stations are bringing increased accuracy to the GLONASS system. At the moment measuring stations are located only on the territory of Russia and Tajikistan, which allows for the monitoring of less than the half of the 24 Russian GLONASS satellites that are currently in orbit. The idea to deploy GLONASS measuring stations in Antarctica was suggested by Valery Vladimirov, deputy chairman of the Presidium of the Krasnoyarsk Scientific Center of the Russian Academy of Sciences as far back as 10 years ago. "We will be able not just to control the satellites, but also to read their signals online to obtain all necessary information about objects anywhere in the world," Vladimirov told RBTH. To control 100 percent of the satellite orbits, a larger number of stations over a greater area are required. In this case, the signal becomes effectively continuous. According to experts, stations in Antarctica will provide an opportunity to increase the reliability of the GLONASS navigation performance significantly. "The Russian Antarctic stations located along the entire coast of the Antarctic continent are the only reasonably accessible place now for the deployment of the ground segment of the GLONASS system in the southern and western hemispheres," Vyacheslav Martyanov, deputy chief of the Arctic and Antarctic Research Institute, told RBTH. According to Fateyev, while the GPS measuring stations are located in almost all parts of the globe, the GLONASS ones are available mostly in Russia. "Due to this, GPS is superior in accuracy to GLONASS," Fateyev explained. "However, with the Antarctic stations in operation, the accuracy of GLONASS will become equal to GPS." Three GLONASS stations are already operating in Antarctica. The preparations to set up the network began as early as 2009. The expansion is planned due to the installation of new equipment. It is being designed by Krasnoyarsk Scientific Center in cooperation with the Siberian Federal University and the Research and Production Enterprise Radiosvyaz, and is being commissioned by the company JSC Information Satellite Systems. It is the latter that builds GLONASS satellites. The first group of specialists from these organizations visited the Russian Antarctic stations Novolazarevskaya, Progress and Bellingshausen in January and February 2015 to determine locations suitable for the installation of the new equipment. 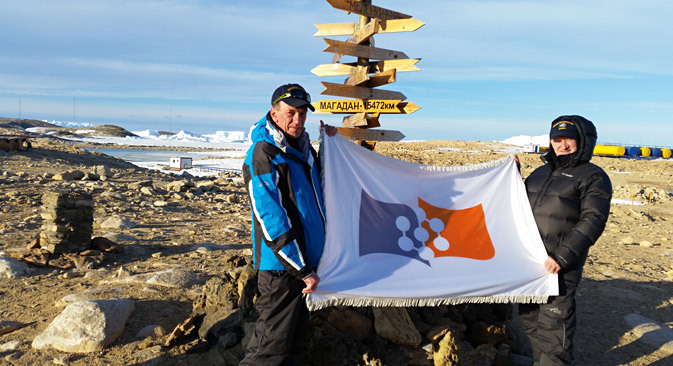 "After that, specialists launched construction to build the objects of the ground control segment of GLONASS and integrate them into the infrastructure of the Antarctic stations," Martyanov told RBTH. The installation of new equipment at the Russian Antarctic stations Progress and Novolazarevskaya will begin as part of the 61st Russian Antarctic Expedition at the end of 2015. In the future, the installation of equipment at three more Antarctic stations – Bellingshausen, Mirny and Russkaya – is being planned.